This title was first published in 2001: Featuring original research concerning young African-Caribbeans in Birmingham, this book addresses complex issues of urban violence and insecurity, racism and discrimination, alienation, resistance and social networks. Employing the methodology of sociological intervention developed by Alain Touraine, the book explores the experiences of a group of young people who are simultaneously presumed to be victims and perpetrators of violence. It examines their relationship to this violence, its meanings for and effects upon them, how they constitute themselves as social actors and subjects, and their capacity for action. The book also addresses the fact that ethnic monitoring and multicultural policies place the question of ethnicity on the British social and political agenda alongside issues of racism and discrimination. Exploring both the perceived and personally experienced position of young people within this context, it sheds important new light upon processes of group identification and action. 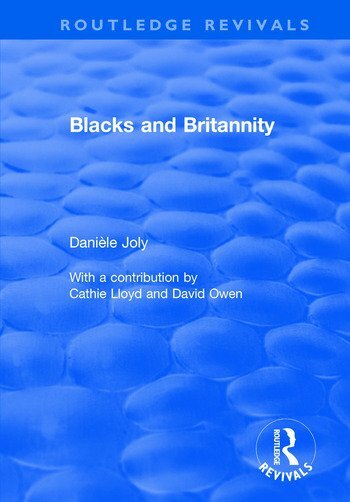 Contents: Introduction, Danièle Joly; Research in ethnic relations in Great Britain: state of the art today, Cathie Lloyd and Danièle Joly; Ethnicity and labour migrants’ mode of settlement; Politics and ethnic minorities, Danièle Joly; Minority ethnic groups in Birmingham, David Owen; Blacks in British society: categorization and ethnicity; Meanings and mechanisms of action; Conclusion, Danièle Joly; Appendices; Bibliography. Danièle Joly' Director, Centre for Research in Ethnic Relations (CRER). Career Outline: Author of Haven or Hell: Asylum Policy and Refugees in Europe (1966), Britannia's Crescent: Making a Place for Muslims in British Society (1995), Refugees: Asylum in Europe (1992) and The French Communist Party and the Algerian War (1991). She is co-editor of Immigrant Associations in Europe (1987) and of Reluctant Hosts: Europe and its Refugees (1989). She is an active member of various European networks of researchers on refugees and asylum. Recently published - edited volume Scapegoats and Social Actors.